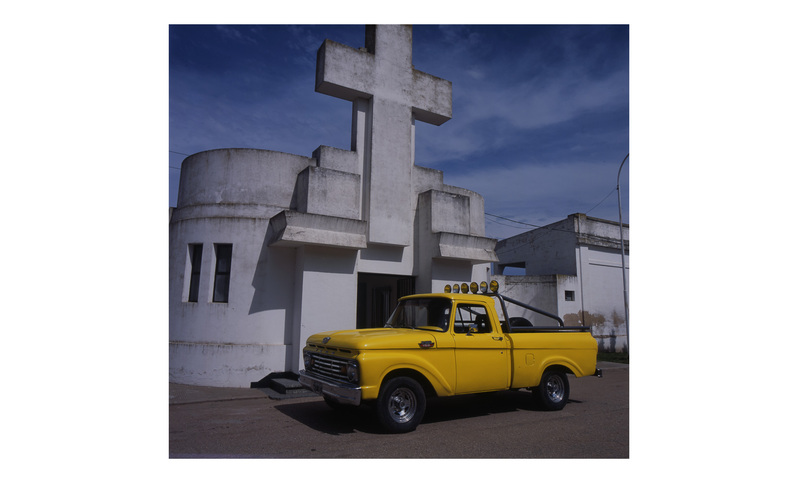 Alluding to the 1955 memoir and travelogue Tristes Tropiques by the anthropologist Claude Lévi-Strauss, López’s Sad Tropics series explores—in vibrant color and elegant formalism—the hybrid reality of contemporary Buenos Aires. Equal parts elegy and observation, López’s photographs evince a universal ambivalence toward urban development and the spread of a global monoculture. Born in 1958 in Santa Fe, Argentina. Lives in Buenos Aires, Argentina. Marcos López abandoned engineering studies in 1982 to dedicate himself fully to photography, an art which he had practiced since the age of twenty. That same year, he received an “improvement” grant from the Fondo Nacional de las Artes and moved to Buenos Aires, where he came into contact with artists from other disciplines and participated in various collective projects. On a grant from the Escuela Internacional de Cine y Televisión, he lived for a year and a half in San Antonio de los Baños, Cuba, making documentaries (1989–90). He published his first book of black-and-white photographs, Retratos, in 1993 and then began to use color, becoming known for his Pop Latino series.